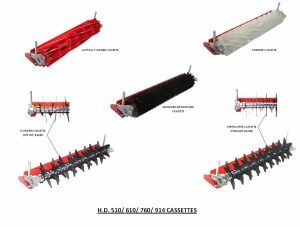 Protea have introduced their new HD cassette system, enabling the proven HD mower to perform a wide range of operations. The reel assemblies bolt directly to the chassis, resulting in a very stiff assembly, and are chain driven. No belts, no chatter, just sound engineering. Pricing is aggressively competitive – far below the competition. The Spanish training camp needed the best pitch mower so they bought a new Protea 914HD. Enough said! Rivendell Projects Limited can now offer instalment terms over 2,3, 4 or 5 years on all new machinery. For example, a fully-featured 20-inch 12-blade model 510G greensmower can be yours for under £13 per week over 5 years (+ VAT) with a low intial payment. We hope that hard-pressed bowls and cricket clubs will find this helpful in these difficult times. The last barrier to ownership of new machinery has been removed. Call us for a no-obligation quotation. “John was so impressed that he bought three machines for the club – a mower, a groomer and a scarifier. They have been his armoury ever since. John uses the Protea groomer once or twice a week prior to mowing, and wishes it had been available to him years ago. Still, he’s more than happy with the three he’s had it under his belt. The difference it has made to the playing surface at Queenborough has been phenomenal, he says. Protea were proud to be chosen as the main mower supplier to the World Cup in South Africa. A total of 87 machines were supplied to all stadia, far in excess of all other suppliers combined. Comments were particularly favourable with many claiming the surface qualities were as good as Wembley! We have always extolled the virtues of these machines and this is proof they are as good, or better, than competing brands. BUY WITH CONFIDENCE, BUY PROTEA! We need more top quality service agents to look after existing Protea customers. Big or small, it doesn’t matter ~ if you can offer exceptional customer service, then we want to hear from you! Rather than buy one cassette machine with two cassettes, have you thought that you could buy two dedicated high quality Protea machines and still make a huge saving? This means two machines doing half the work each, two machines available to work all of the time, enough spare cash to buy a third machine and Protea reels are interchangeable should your circumstances change in the future. Makes sense, doesn’t it? Are you limping along using an old machine held together by willpower? Need to replace it with someone else’s sell off? Can’t afford a new one? THINK AGAIN! Now you can avoid the secondhand lottery and for roughly the same price as a secondhand machine, you can afford a BRAND NEW Protea mower with a comprehensive 2-year parts and labour warranty. If you are in any doubt as to the quality of these machines then you really must see our TESTIMONIALS page. The comments are 100% authentic and from genuine customers. Protea machines are now in EVERY Test Ground in South Africa! Now that’s impressive! These same machines can be yours for half the price of competing brands. Protea increases its market share of South African bowlsclub market from an already huge 95% to a whopping 99%!